When Prozac (fluoxetine) burst on the scene in the 1980s there was much hoopla and hope that those blue and yellow capsules would provide the long sought cure for depression.However, this was not the case and people eventually searched for non-medicated depression solutions. Increasing demand for antidepressants led to dozens of such drugs to enter the market, culminating in more than one out of ten Americans taking the medications by the early 2000s. The prescription rates for antidepressants jumped 400% over a ten-year period—1988-1994, 2005-2008—according to data published by the National Center for Health Statistics. Recent studies on the efficacy of antidepressants have somewhat taken the shine off the penny, however, regarding this class of drugs as the miracle cure for depression. While antidepressants were supposed to increase serotonin in the brain and correct the chemical imbalance, published meta-data implies that in a majority of patients the bounce in mood is the result of the placebo effect, and is often short-lived. Another bump in the antidepressant road involves the vast list of adverse side effects that come with this class of drugs. Many of the antidepressant drugs are not well tolerated, leaving patients with weight gain, insomnia, dry mouth, sexual dysfunction, irritability, nausea, fatigue, and diarrhea. In young patients aged 18-24, a heightened risk of suicide associated with antidepressants presents a very serious side effect. Fortunately, there are non-drug depression treatments out there that offer relief without all the negative effects. Transcranial magnetic stimulation (TMS). TMS offers a safe, well-tolerated and non-invasive alternative therapy for treatment-resistant depression. Using electro-magnetic pulses through a coil directed to the mood region of the brain, TMS stimulates underactive brain cells and rebalances brain chemistry without drugs. Psychotherapy. Cognitive behavioral therapy (CBT) is another non-drug depression treatment that has been effective in helping patients with depression identify destructive thought patterns that trigger depressed mood and train the brain to react differently to these triggers. Exercise. Exercise is a simple and low-cost non-drug depression treatment that anyone can employ. Ample evidence showing the connection between regular exercise and improved mood supports adding a fitness regimen of 30-minute cardio workouts 3-5 times per week. Exercise alters the mood-regulating brain chemistry and releases endorphins. Yoga. Practicing yoga postures, breathing exercises and guided imagery can relieve anxiety and stress, and improve the functioning of all bodily systems. Yoga encourages depression patients to incorporate the practices into their daily life. Mindfulness techniques. Mindfulness practices train the depression patient to focus on the present experience without judgment. Using deep breathing to achieve a heightened awareness of physical sensations, mindfulness techniques giving the patient a sense of control while reducing stress. Acupuncture. The traditional Chinese practice of inserting needles to correct imbalances to treat physical and emotional maladies is shown to help with depression. This corrects what is termed the Qi, or the flow of energy within the body, improving the emotional state. Herbal supplements. Some herbal supplements have been shown to help alleviate the symptoms of depression. The most widely used for this purpose are St. John’s Wort and Sam-E. Be sure to ask your physician before using any herbal supplements that may interact with other medications. Meditation and journaling. Spending time in relaxed contemplation can lead to spiritual awareness and self-enlightenment. Meditation leads to a state of altered consciousness through deep breathing while sitting in a specific posture. Journaling later about any revelations or insights learned while in this altered state can be helpful in overcoming depression. Improve sleep habits. Without quality sleep for at least seven hours per night, it is unlikely that depression symptoms will disappear. A strong link exists between quality sleep and positive mood. Make a sleep routine where bedtime is consistently the same, and avoid alcohol, exercise and eating after 7:00 p.m. Nutrition. A healthy diet is important for improving brain health, which translates to mood. A poor diet will make overcoming depression difficult. A diet rich in lean proteins like fish, turkey, and chicken, whole grains, nuts, and fresh fruits and vegetables will nourish the brain. Minimize sugar, caffeine, and alcohol to enhance the nutritional effects and improve mood. 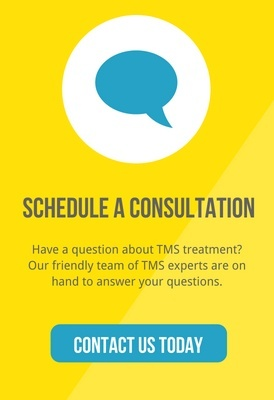 Achieve TMS is a leading provider of Deep TMS (dTMS), a safe, non-drug depression treatment, with office locations from coast to coast. The expert doctors and treatment providers have vast experience using dTMS to help treatment-resistant patients suffering from depression. For more information about dTMS, please contact us today at 855-405-2055.